An enthralling new telling of Shakespeare’s Romeo and Juliet—told from the perspective of Juliet’s nurse. In Verona, a city ravaged by plague and political rivalries, a mother mourning the death of her day-old infant enters the household of the powerful Cappelletti family to become the wet-nurse to their newborn baby. As she serves her beloved Juliet over the next fourteen years, the nurse learns the Cappellettis’ darkest secrets. Those secrets—and the nurse’s deep personal grief—erupt across five momentous days of love and loss that destroy a daughter, and a family. By turns sensual, tragic, and comic, Juliet’s Nurse gives voice to one of literature’s most memorable and distinctive characters, a woman who was both insider and outsider among Verona’s wealthy ruling class. Exploring the romance and intrigue of interwoven loyalties, rivalries, jealousies, and losses only hinted at in Shakespeare’s play, this is a never-before-heard tale of the deepest love in Verona—the love between a grieving woman and the precious child of her heart. In the tradition of Sarah Dunant, Philippa Gregory, and Geraldine Brooks, Juliet’s Nurse is a rich prequel that reimagines the world’s most cherished tale of love and loss, suffering and survival. I had to really concentrate on going into this book with an open mind. You see, I really don't like Romeo and Juliet. I do enjoy Shakespeare, but that particular play is probably my least favorite of the ones that I've read. It was only when several history professors told me that modern audiences had it wrong--in Shakespeare's time, the tragedy was not the death of two young lovers, but the fact that two kids died because they DID NOT LISTEN TO THEIR PARENTS--that I finally had any real appreciation of the play. So, I went in with as open a mind as I could and, well, I was surprised. I enjoyed this book far more than I had expected. The main character (Juliet's nurse, obviously) is Angelica--a middle aged woman who has buried all her sons and then the infant daughter she did not know she was expecting. As was common, Angelica is then contracted to be a wet nurse for a wealthy family's infant daughter, Juliet di Cappelletti (or, you know, Capulet). 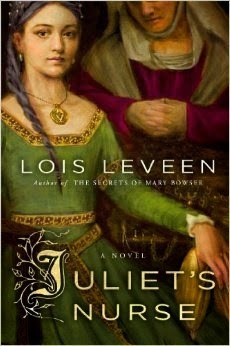 The bulk of the book develops Angelica and her relationship to Juliet. It's a complex one, and one that is completely heart-wrenching. Angelica also becomes a mother figure to Juliet's cousin, Tybalt, who is also a well-drawn character (and far more interesting here than he is in Shakespeare's play). I loved Leveen's writing. She did an exceptional job at creating 14th-century Verona for the reader. Her voice is lyrical and readable and I found myself drawn into her prose. I was worried that the book would begin to drag towards the end when Leveen's narrative would meet Shakespeare's. After all, we all know how this one is headed (answer: not well) and I didn't see how Leveen could keep momentum going as she zoomed towards and already defined ending. Here again, I was surprised. Leveen is able to not only avoid lagging, but also to accelerate the speed of the plot in a way that the reader can't put the book down, even though they know how it all ends. And, even with the pre-determined ending, I found the conclusion of this book very satisfying. I did have a few minor quibbles about the book. I wish Leveen had flushed out Juliet's character more--she took such care with Tybalt that I was surprised that she did not do the same with a more major character. There were also times where Leveen used lines from Shakespeare as dialogue. While that is clever, they didn't match the dialogue in the rest of the book, which I found a little unsettling. Those, however, are small things. They may have kept Juliet's Nurse from being a perfect book, but they did not stop this from being a highly enjoyable book that I would readily recommend to others. I received a copy of this book through the Goodreads First Reads program. I was encouraged, but not required, to write a review. I received no other compensation for this post.